Flags from Omnimap, world leader in map supply. We stock a large selection of flags of all of the states in the USA, the foreign countries, the United Nations, and a some historical flags. 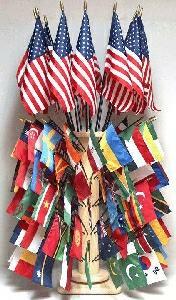 All flags are available in the 4" x 6" size, and many flags are also available in 8" x 12" and 2' x 3' sizes.